About San Diego Master Dog Trainer David Ruiz of ABC - A Better Canine - School for Dogs in La Mesa San Diego specializing in puppy dog training, dog behavior training, guard dog training, dog leash training, home dog training, hunting dog training, online dog training, puppy obedience training, puppy training tips, guide dog training, clicker dog training, dog training advice, service dog training, therapy dog training and professional dog training. Mr. Ruiz was born in Guatemala, located in Central America. In January 1955, when he was 12 years old, he immigrated to the United States. Soon after, he became associated with Pilot Dogs, Inc., a school for the training of guide dogs for the blind. There he served as kennel-boy, interpreter for Spanish speaking blind students, and a trainer and instructor. He attended Ohio State and Franklin Universities in Columbus, Ohio, and during the Viet Nam era, served in the United States Marine Corps. 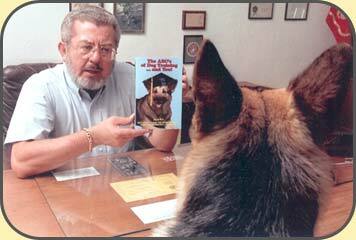 Since 1978, he has been the Owner/Director of ABC (A Better Canine) School for Dogs in San Diego, California. This location has closed. Please contact us for our new location!